Leopards Rock Bush Boutique - Bela-Bela Accommodation. Discover serenity, luxury and privacy in the heart of the Waterberg and prepare to regenerate body and soul. Nestled in the heart of the bushveld and overlooking a gorge, Leopards Rock Bush Boutique Apartments are located in an exclusive country estate just 15 minutes from Bela-Bela. Only 3 open plan, spacious Apartments are set on a rocky incline with sweeping views over a majestic gorge. Enjoy this spectacular view from the comfort of your tastefully decorated apartment while the birdlife and peaceful surroundings soothe your stresses away while indulging from the beauty and tranquility to restore your energy. Prepare to be blown away as you step into the stylish, ingeniously-designed self-catering units. Our décor provides an earthy and relaxed atmosphere inspired by nature. Awaken each morning to the chorus of abundant wildlife. This is where you restore your sanity and recharge your battery. Each uniquely distinct Apartment offers its own stunning view. Invite yourself into the arms of nature when opening the big folding doors. Relax each afternoon in your own private solar-heated plunge/pool and enjoy a sundowner as the stars appear in the night-sky. I AMNESS is the perfect Apartment if you want to have quality time with friends or family. Three bedrooms, each with en-suite bathroom, and a fully-equipped kitchen ensure an at home feeling. A spacious living area with outside balcony and braai facilities invites you to be part of nature while enjoying an amazing view. OPENNESS is an executive honeymoon Apartment. Open the big folding doors from the living area as well as the bedroom and invite nature into your home. A custom-designed king-size bed ensures a romantic honeymoon or well-deserved break with your special person. As the sun slips down the sky and the fire crackles, enjoy a glass of wine in the pool overlooking the gorge and valley. ONENESS is a two-bedroom Apartment perfect for family or friends wanting to get away to nature and revitalize body and soul. 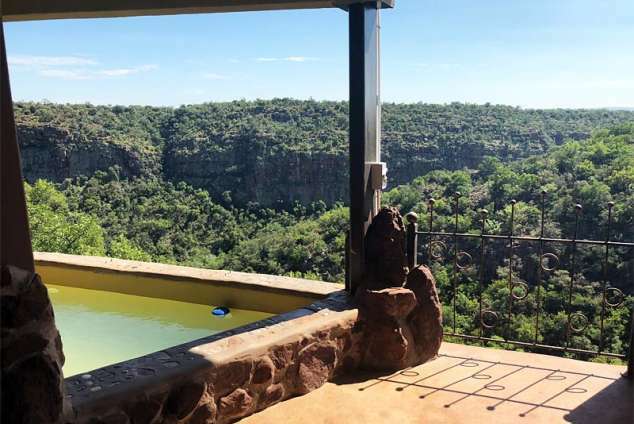 An open-plan kitchen and braai facility, with the fresh bushveld air blowing gently, and the gorge and valley views ever-changing, will ensure an unforgettable holiday. Leopards Rock is a 300 hectare country estate and has abundant wildlife in addition to numerous bird species, and home of a pair of black eagles. A peaceful area ideal for cycling and several walking trails offer the opportunity to enjoy the fresh air of the bushveld. Game is roaming freely i.e. impala, giraffe, kudu, nyala, sable, zebra, blue wildebeest, red hartebeest, eland, blesbok, warthog, bush pig, leopard, lynx, and home of a pair of black eagles. 4290 page views since 06 Feb, 2018.